We conducted this audit of take-home vehicles because of our previous findings of noncompliance with IRS regulations and incomplete implementation of recommended corrective actions. In 2006, our audit of payroll tax compliance reported that the city did not track personal use of city-owned vehicles and report it to the IRS (Internal Revenue Service) as required. Audit follow-up in 2010 showed no correction of this finding. 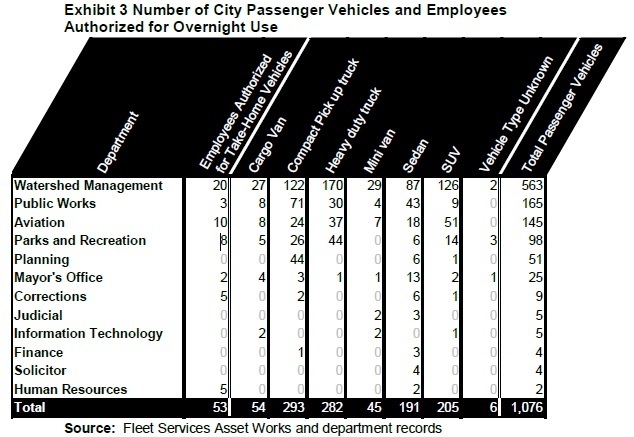 Our 2012 follow-up found that the city had begun reporting employees’ taxable use of city vehicles. City policy still did not, however, include enforcement methods, and the city code revisions we recommended had not been proposed or adopted. The city’s continued weak controls over the use of city vehicles put the city at risk of unauthorized commuting and other personal use, as well as underreporting of taxable fringe benefit income. Departments with most of the city’s vehicles (excluding police and fire) do not require employees to record business and personal use of vehicles and have no other method of tracking vehicle use and location. Current city policy invalidates the finance department’s valuation method for 2013 IRS reporting because it allows some personal use and is not allowed for employees with salaries above a specified limit.